Those were the words of Ohio State quarterback Tate Martell on Rose Bowl media day just over two weeks ago when talking about the Buckeyes quarterback competition for the 2019 season. Less than a month later Martell is headed to Miami and the entire quarterback landscape has gone through a tectonic shift. Not just at Ohio State, but across college football. Here are the major transfers that have taken place just this month. … after saying he would stay and compete for the job, Martell had an abrupt change of heart. After Fields was seen at an Ohio State basketball game on the sidelines with Urban Meyer and Haskins, the writing was on the wall that he was coming to Columbus (with an eye on the starting gig). Martell then announced on Tuesday night that he would be transferring to the University of Miami. 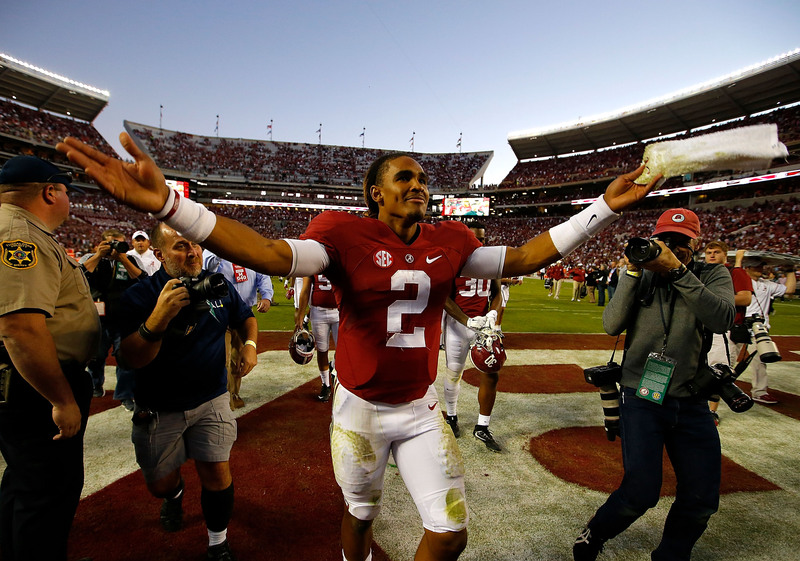 Martell’s move to Miami took one option away from Alabama quarterback Jalen Hurts. The quarterback who appeared in three consecutive national championship games with Alabama is making the move to Oklahoma as a graduate transfer. That means he’ll be free to play right away in 2019 for a school that is now making a habit out of turning transferred quarterbacks into Heisman Trophy winners (Baker Mayfield and Kyler Murray). While those are the three biggest moves by far, there have been many others as well. Hurts’ move to Oklahoma means Austin Kendall is leaving for West Virginia. Thankfully, Oklahoma relented on blocking the transfer because it was a really bad look for Lincoln Riley and the university to not allow their own player to leave after relying on so many transfers themselves in recent years. After losing his job to Trevor Lawrence at Clemson, Kelly Bryant will play for Missouri in 2019. The Tigers will have another transferred quarterback in 2020 with the transfer of TCU’s Shawn Robinson. UCF will look to continue their success with former Notre Dame quarterback Brandon Wimbush, who will likely play the 2019 season in place of injured star McKenzie Milton. Of course, quarterback transfers aren’t exactly a new phenomenon in college football (remember Troy Aikman’s move from Oklahoma to UCLA?). However, the proliferation of those transfers is increasing exponentially thanks to new rules. Never before have we seen so many elite quarterbacks change schools so frequently. We’re talking about players who have national championship or playoff experience (Hurts and Bryant) or players who were four- and five-star recruits coming out of high school (Martell and Fields). Fields was even the number one prospect overall in his class, yet found himself behind Jake Fromm on the Georgia depth chart before transferring. This is a whole new world for college football—a world where freedom of player movement is actually a thing. The graduate transfer rule was just the beginning. Allowing players to extend their college careers by playing for a year at a new school after receiving their degree has allowed them to get fresh starts or second chances. Look no further than Super Bowl champion Russell Wilson and his time at Wisconsin to see the long-term impact grad transfers can have. But now with less restrictive transfer rules, players are making these moves towards the beginning of their college careers. So much has been made about the mythical NCAA Transfer Portal but it represents a huge shift in the power structure of college football. Instead of coaches and programs maintaining all of the power, dictating or restricting where players can and can’t go (which led to some very ugly situations), players can now put themselves in the database and openly seek new opportunities elsewhere. And it could be just the beginning too. A potential change ahead is allowing players to transfer and not sit out a year if their coach leaves for another job as well. In truth, it is the absolute bare minimum the NCAA should do for players who still aren’t being paid a fair amount or even allowed to profit from their likenesses. Freedom of movement has only ever existed one way in college athletics—for coaches who can go on and seek better and higher paying jobs while players have often been left behind. Perhaps Franklin should have challenged himself by staying at Vanderbilt instead of bolting for Penn State and overcoming adversity to compete in the SEC. Perhaps the players he recruited to Vanderbilt felt the same way about him. Freedom of movement is vital for players because it’s now one of the few things they have to improve their college experience. These athletes only have a limited amount of time in order to make an impression on NFL scouts in hoping to make it to the next level. We haven’t seen the full spectrum of what Martell and Fields are capable of because they’ve sat behind great quarterbacks in their own right. And in order to truly fulfill their full potential and give themselves the best chance of success at the college level and possibly the pro level, they need opportunities to play. College football will evolve. We will see elite programs go through more changes to their rosters than ever before. If a four-star recruit who has NFL dreams and aspirations is stuck behind a five-star recruit at a place like Alabama or Clemson, then they may think it’s best for their future to try to break through somewhere else. Ohio State would have never imagined a situation where Tate Martell wasn’t their quarterback of the future and Justin Fields was. It’s going to be really weird seeing Jalen Hurts line up in a different team’s red and white uniform. But such is the nature of the system college football has created for itself. Freedom of player movement doesn’t represent the end of college football as we know it. Rather, it represents an increase in opportunities for athletes across the board. Finally, that’s some good news for them.